That is where a serialized television show beats movies. And this where movesbeat serialized television. Because while a TV show running hundreds of hoursoffer unprecedented opportunities for character development and growth.Characters can change in a subtle, gradual, realistic way that they couldn’t ina brief movie rush. Yet, many serialized TV shows – the sort with ongoing plots instead of simplecases-of-the-week – have a problem. Some stories aren’t meant to last 100episodes. Some stories deserve to be a movie, or a miniseries, or a two seasonarc. And as TV producers increasingly try to turn well-worn movie genres intotelevision series, they run into a major problem: TV’s the wrong medium. It’snot just a matter of finding enough plot, it’s a matter of followingthe arc the story demands be told. Sunday’s Walking Dead had a sequence, that, had it aired in a movie,would be justly remembered as one of the most tense movie sequence ever. Rightup there with the raptors chasing the kids in Jurassic Park. 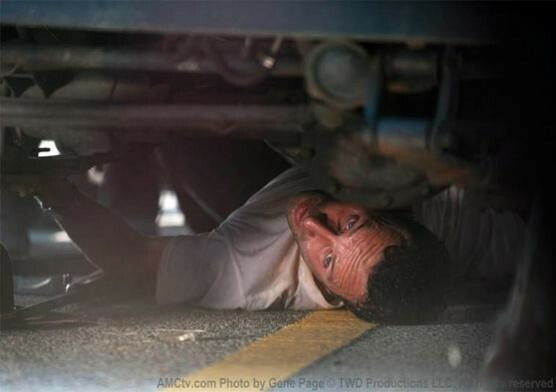 Ourcaravan of heroes must hide underneath cars, not saying a word as zombiesshuffle past. Nearly silent, impeccably directed, it boiled down suspense to itsessence: Anything, at any time, could go wrong. And sometimes, it does. But here’s the problem: Zombie stories, generally, are about attrition.They’re about our heroes surviving, being picked off one by one, then eitherbeing wiped out totally by the zombies or saved/slaughtered by the military. InTV critic Zack Handlen’s reviewof the season premiere he makes that point precisely. “…for a television series or an ongoing comic book, the relentlessly downbeatnature of the genre is more difficult to negotiate,” Handlen writes. Both zombie and horror stories center around endings. And television neverworks well when it focuses too much on endings. Television focuses on character, and problematically, serialized shows don't succeed by making the villain a force of nature. Zombiesaren’t characters. They’re forces of nature. The same, really, goes for aspooky-ooky haunted house, a major problem with American Horror Story. Serialized television shows only work, ultimately, when they make thevillains characters. They can either have a character fight with himself(Mad Men), fight with other characters (24), or fight withboth (Breaking Bad.) Characters can change, characters can surprise,they can get into all sorts of twisty back-stabbing drama. But when charactersare just fighting forces or nature of the idea of inevitability, inevitably, viewers begin to stop care aboutwhy they’re fighting. Give zombies enough time. They’ll get boring. Horrible conversationalists.